Dynamic Audio Device (DAD) manufacture cutting edge professional loudspeakers, with products ranging from entry level, to the finest sounding point-source loudspeakers available at any price. The Dynamic Audio Device (DAD) range of professional loudspeaker solutions represents the perfect balance of cutting-edge technologies, performance and price. 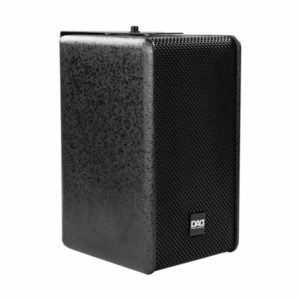 With their real affordability, state-of-the-art electronics and robust construction, the products deliver exceptional performance and value for live sound reinforcement applications. DAD products fulfill the entry-level market with their Live series, right up to the Touring Power series – one of the very finest sounding point-source loudspeaker solutions at any price. Interested in finding out more about the Dynamic Audio Device (DAD) range of professional audio products, then arrange a demo. We supply a full range of DAD Installation Speakers. Please contact our Sales Team who will be happy to offer pricing and advice to find a solution that meets your requirements.